We have a bittersweet episode of Radio Free Charleston on New Appalachian Radio this week. Not long ago Tom Medvick suddenly and surprisingly passed away. This was a shock to his friends in the music scene and where he worked at the West Virginia Department of Transportation and also people whose lives Tom touched in college and coaching his kid’s in sports. And of course it has been an unimaginable horror for his wife, Wendy and their children, and the rest of Tom’s family. Our thoughts are with them as we take two hours to remember the music of Tom Medvick. This edition of Radio Free Charleston on New Appalachian Radio can be heard in the Voices of Appalachia archive right HERE or listen to it here HERE. Tommy was a great guy and one of the most powerful drummers I’d ever seen. Always upbeat and hilarious. He was a frequent guest on the original Radio Free Charleston broadcasts and he was not just a good friend, but a great friend. I am going to miss him terribly, and I’m hoping that this tribute can help his friends remember him, and let those who didn’t know him understand what a wonderful person he was. Over the course of two hours you will hear music from The Swivels and The Feast of Stephen, two of the major musical projects Tommy worked with. You may also remember, if you are elderly enough, that The Swivels started out as The Swivel Rockers, then shortened their name late in 1989.He was also the lead figure in Tommy Spear and The Mints, but sadly I don’t have any of their music in my archives. What we do have is pretty incredible. Tommy was an amazing musician and I hope that you can get an idea of how fantastic he was in this show. We are going to kick off the show with some rare demos that the Swivels recorded, which come to us courtesy of Tom’s bandmate in both the Swivels and Feast of Stephen, John Radcliff. You can listen to Radio Free Charleston’s streaming radio incarnation at 10 AM and 10 PM on Tuesdays (and again at midnight Thursday) at New Appalachian Radio, part of Voices of Appalachia. If you miss it, check our the archives for previously-aired shows. You can also listen to Radio Free Charleston Saturday at Midnight. Saturday, RFC airs for six hours, starting at midnight. We’re also going to listen to a couple more Swivel tunes before we move on to The Feast of Stephen. As we dig into the Feast of Stephen music you may notice that they revisited some of the Swivel songs. In fact, in this show, you will hear song three times. Following the dissolution of the Swivels, Tommy joined a new band which included his Swivelling cohorts Bob Miller and John Radcliff. Joined by Dan Jordan and Joe Vallina, Feast of Stephen was a powerhouse of creative original music in the early 1990s. With a rejuvenated lust for music and the production wizardry of Dave McClanahan, who I think I can now safely reveal as The Mad Scientist Club, Feast of Stephen released two killer albums. Thanks to Mr. McClanahan, we will now hear the music of Feast of Stephen, nineteen songs, directly from the digital masters. 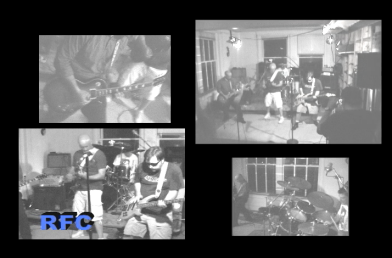 In 2007, for episode 23 of the Radio Free Charleston video program, we somehow managed to reunite Feast of Stephen more than fourteen years after they’d last played togher. This was a one-night performance at LiveMix Studio. For the remainder of our show this week, you will hear highlights from that night, including Tommy’s own account of how we pulled it all together. This show, while packed wall-to-wall with great music, is not one that I wanted to assemble. I would much rather Tommy still be with us. The truth is, I was planning a show featuring the music of Feast of Stephen in the weeks before Tommy left us. I want to thank Dave McClanahan and John Radcliff for their help putting this show together. I hope we did Tommy proud. Thanks Rudy. Tom was a force for goodness, humor, and music that will be greatly missed.